He is currently the co-director of the Center for Cognitive Studies and the Austin B. Fletcher Professor of Philosophy at Tufts University. Dennett is an atheist and secularist, a member of the Secular Coalition for America advisory board, and a member of the Committee for Skeptical Inquiry, as well as an outspoken supporter of the Brights movement. Dennett is referred to as one of the "Four Horsemen of New Atheism", along with Richard Dawkins, Sam Harris, and the late Christopher Hitchens. Dennett graduated from Phillips Exeter Academy in 1959, and spent one year at Wesleyan University before receiving his Bachelor of Arts in philosophy at Harvard University in 1963. At Harvard University he was a student of W. V. Quine. In 1965, he received his Doctor of Philosophy in philosophy at the University of Oxford, where he studied under Gilbert Ryle and was a member of Christ Church college. He has been doing research into clerics who are secretly atheists and how they rationalize their works. He found what he called a "Don't ask, don't tell" conspiracy because believers did not want to hear of loss of faith. That made unbelieving preachers feel isolated but they did not want to lose their jobs and sometimes their church-supplied lodgings and generally consoled themselves that they were doing good in their pastoral roles by providing comfort and required ritual. The research, with Linda LaScola, was further extended to include other denominations and non-Christian clerics. Dennett has been critical of postmodernism, having said: "Postmodernism, the school of 'thought' that proclaimed 'There are no truths, only interpretations' has largely played itself out in absurdity, but it has left behind a generation of academics in the humanities disabled by their distrust of the very idea of truth and their disrespect for evidence, settling for 'conversations' in which nobody is wrong and nothing can be confirmed, only asserted with whatever style you can muster." Dennett married Susan Bell in 1962. They live in North Andover, Massachusetts, and have a daughter, a son, and four grandchildren. He is an avid sailor. ↑ Although Dennett has expressed criticism of human sociobiology, calling it a form of "greedy reductionism", he is generally sympathetic towards the explanations proposed by evolutionary psychology. Gould also is not one sided, and writes: "Sociobiologists have broadened their range of selective stories by invoking concepts of inclusive fitness and kin selection to solve (successfully I think) the vexatious problem of altruism—previously the greatest stumbling block to a Darwinian theory of social behavior. . . . Here sociobiology has had and will continue to have success. And here I wish it well. For it represents an extension of basic Darwinism to a realm where it should apply." Gould, 1980. "Sociobiology and the Theory of Natural Selection" In G. W. Barlow and J. Silverberg, eds., Sociobiology: Beyond Nature/Nurture? Boulder CO: Westview Press, pp. 257–269. 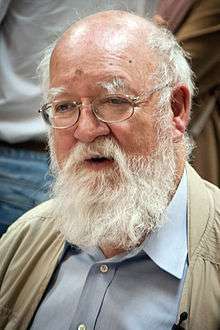 Wikimedia Commons has media related to Daniel Dennett.